Renee has attended 52 classes since January 1st. That’s more than any other Freakin CrossFit member. Even with an inconsistent work schedule, she makes no excuses and always finds a way to squeeze in her workout. 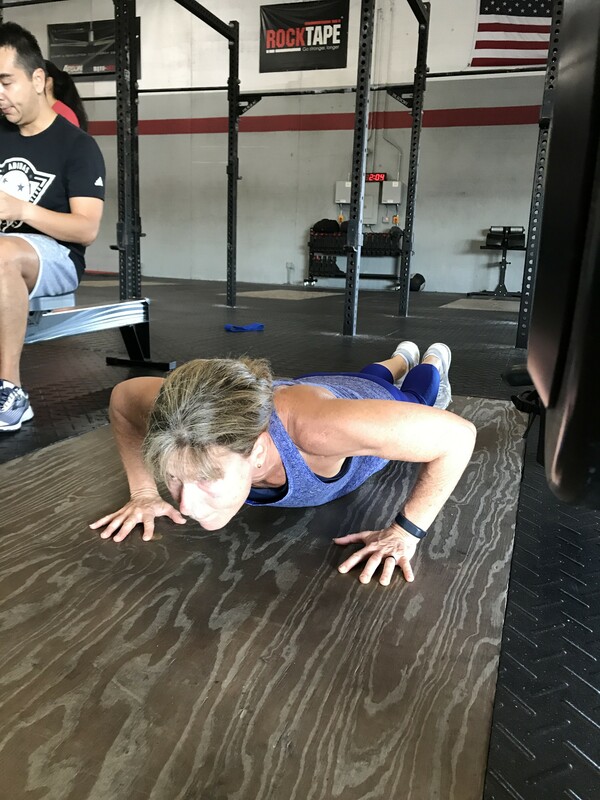 Renee is a member that takes advantage of everything that Freakin CrossFit has to offer, from the Endurance class on Saturdays, to the weekly Barbell class. She trains hard and always with open ears ready to learn whatever tips her Coaches have to offer. Additionally, Renee is very friendly and encouraging. During Saturday Team WOD she is willing to team up with anyone, from elite athletes to beginner CrossFitters. She never makes excuses and will train through anything; we’ve seen her run in pouring rain and work out on the coldest mornings. Renee is a great example of an exceptional, consistent member and true fighter! I am 51 years old and work in law enforcement as a Police Sergeant. I was involved in an accident in 2011 requiring several surgeries and was having a difficult time getting back to the same physical level I was prior to this incident (running half marathons). My husband Alan talked me into going to Freakin CrossFit and doing an on ramp class (I was reluctant to try at first) however we decided to try it together. From the very first class, I really enjoyed the workouts and was impressed with the coaches willingness to assist in not only my development but everyone in class. When I started I couldn’t lift more than three pounds overhead. I have learned to be patient with my workouts and small gains will come and grow into bigger gains. My proudest moment in CrossFit is being able to monitor my progress and being able to do chin ups with no bands. My favorite excerise movement is between deadlifts and front squats. My CrossFit goals are to make small gains and to perfect my form on all movement, I would like to be able to do HSPU some day. My nutrition has improved since CrossFit and I started with Javier a few weeks ago and was surprised to learn my nutrition was a bit off. I believe now my nutrition is very good. The one tip I would give someone is take it one step, one pound at a time and you will be surprised at your progress and listen to the coaches they are there to assist in your development as a CrossFit participant. I enjoy running , going to Panther hockey games and spending time with my husband. I am very thankful to all the coaches for their guidance in my progress I have made since joining.